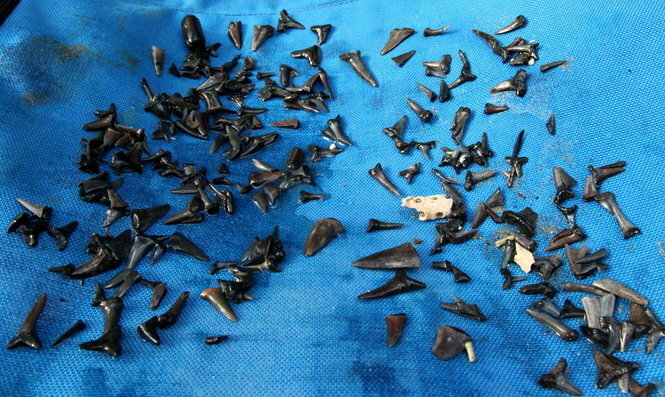 Ben Raines' latest expedition into Alabama's natural history is this piece: Ancient shark teeth in Alabama creeks point to a past ruled by prehistoric predators | al.com. It is a reminder of how the warming and cooling of the planet over time have had a dramatic effect on the state we call home. From the geologic layers of the Red Mountain cut to the fossils of prehistoric whales and Ice Age sloths found in various locations, it's fascinating to think about the Alabama's journey through the eons. Years ago, I wrote about a book by Jim Lacefield that explored the Lost Worlds in Alabama Rocks. The current Alabama Hertitage magazine has a geologic jaunt through Alabama by John C. Hall. "As the various ice ages came and went over millions of years, sea level rose and fell around the globe. For Alabama, those changes meant sea level changed dramatically, by hundreds of feet at a time. An underwater cypress forest explored by AL.com in 2012 that lies about 10 miles south of Fort Morgan represents sea level about 50,000 years ago, during the recent ice age, while sand dollars found along the Alabama River near the Claiborne Dam and the sharks' teeth in this creek show how much higher the seas were 40 million years ago, during an ancient warm period." Excerpt: What we see, in other words, is not a redistribution in the name of historical justice, but an integration of black workers into the regional economy. When we consider that the civil- rights movement opened the South to inflows of capital, creativity and new enterprises from around the world, it becomes clear that most white Southerners were also long-term beneficiaries of this revolution.